TORONTO (May 9) — If you are wondering, in part, how the dramatic improvement of the Toronto Maple Leafs has influenced their loyal fans, consider this: While reacting, en masse, to a blog I wrote over the weekend, the majority of readers claimed they would not trade William Nylander to Los Angeles straight–up for Drew Doughty. You read that correctly. Maple Leaf zealots today would not accept one of the top–five defensemen in the National Hockey League — the defending Norris Trophy recipient and a two–time Stanley Cup winner — in a one–for–one swap involving Nylander, who scored 22 goals this season. So much for what I expected. In the blog, I merely wondered if the new Kings’ management — led by GM Rob Blake — would consider a dramatic change after the club missed the playoffs in consecutive years. Given that L.A.’s attack was sluggish this season, and the Leafs almost–certainly will not move into legitimate contention without a Norris Trophy threat, I proposed a trade of Nylander; defense prospect Travis Dermott, plus first and third–round draft picks for Doughty — at 27 years of age, in the prime of his brilliant career. If anything, I figured people would call me crazy for suggesting the Kings agree to such a deal. Instead, I was pilloried for mentioning Nylander to Los Angeles… by himself. Forget about Dermott and the draft picks. No way Nylander is getting traded; definitely not now. Maybe JVR, a first and more. But, not Nylander. They would be crazy to do that. 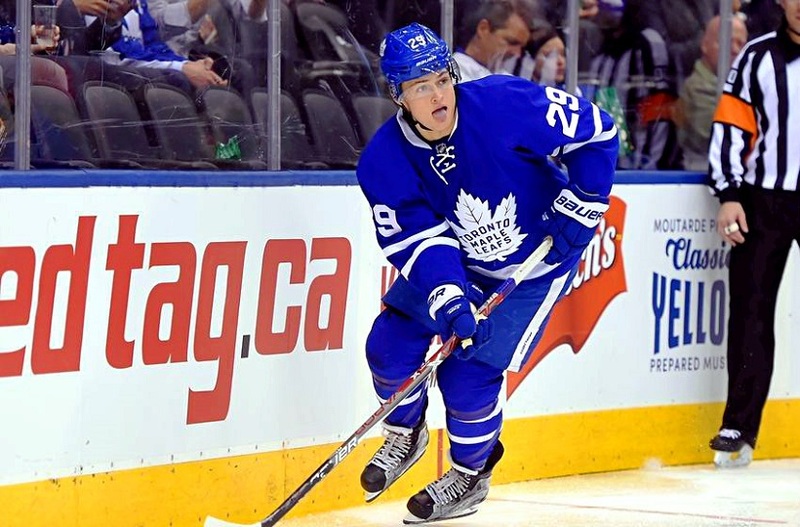 I’m wondering if it would be worth giving up a budding star in Nylander for a star defenseman close to his 30’s. Yikes! I don’t know. It will take more than that. It took Taylor Hall (top–scoring LW over past three years) to get Adam Larsson. It will take Marner. And, a bad contract, too. Why in the world would you trade Nylander? No thanks. Let’s keep him. Hefty price to pay. Type of trade Leafs should not make at this point. We definitely need an upgrade on D. I like Willy, but would pull that trade. We want younger — not guys ready to retire. Yes, at 27, and one season removed from winning the Norris Trophy, Doughty is “ready to retire”. 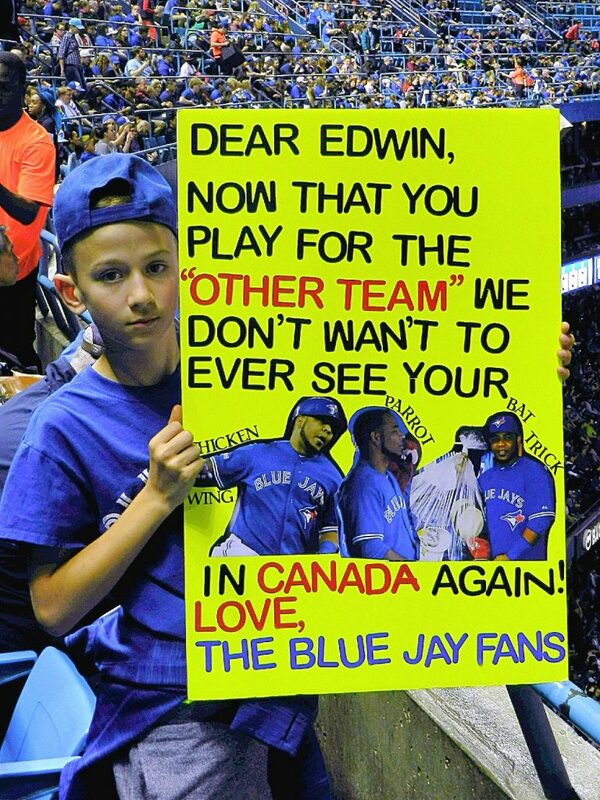 For as long as most can remember, Toronto hockey fans have over–valued players. Prior to the current administration, led by Brendan Shanahan and Lou Lamoriello, this unconditional, tribal worship spawned the so–called “Blue and White Disease”, whereupon third and fourth–line grunts assumed an aura of entitlement foreign to star players in other cities. Shanahan and Lamoriello developed a more rational environment, yet many fans of the Leafs still lack perspective. Yes, Nylander is an exceptional talent with 40–goal potential. Exactly the caliber of player that might help fetch a Norris Trophy candidate — if such a commodity were made available. Elite defenseman are infinitely more rare than scoring prospects. 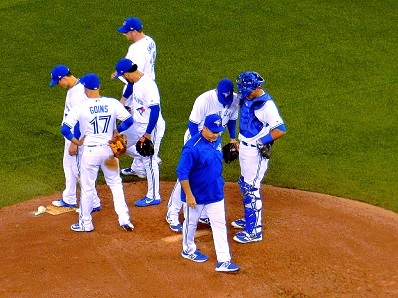 Good teams become great, in part, by dealing surplus to fill gaping holes. In this instance, the Maple Leafs have assembled enough skill and creativity up front… yet nothing close to a top–drawer talent on the back end. Acquiring Doughty for Nylander would thrust Toronto into immediate contention in the Eastern Conference. Los Angeles would need a wondrous package to even consider such a move. And, again, might think about it only because a Stanley Cup team has regressed around the London, Ont. native. As I’ve done on numerous occasions in this corner, I invite fans that may not comprehend the urgency of an elite defenseman to review the 46 Stanley Cup winners since 1970. How many have not possessed a Norris Trophy candidate and/or future Hall–of–Famer on the blue line? From Bobby Orr (Boston) to Larry Robinson, Serge Savard and Chris Chelios (Montreal); Denis Potvin (New York Islanders); Paul Coffey (Edmonton); Al MacInnis (Calgary); Coffey and Larry Murphy (Pittsburgh); Brian Leetch (New York Rangers); Scott Niedermayer and Scott Stevens (New Jersey); Rob Blake and Raymond Bourque (Colorado); Murphy and Nick Lidstrom (Detroit); Derian Hatcher and Sergei Zubov (Dallas); Dan Boyle (Tampa Bay); Niedermayer and Chris Pronger (Anaheim); Kris Letang (Pittsburgh); Duncan Keith (Chicago); Doughty (Los Angeles). Perhaps three or four champions during that time have pulled through without such a luxury, usually as a result of phenomenal goaltending: Philadelphia in 1974 and 1975 (Bernie Parent won the Conn Smythe Trophy both years). Edmonton in 1990 (after trading Coffey to Pittsburgh). Montreal in 1993 (though Matthieu Schneider and Eric Desjardins were pretty darn good). 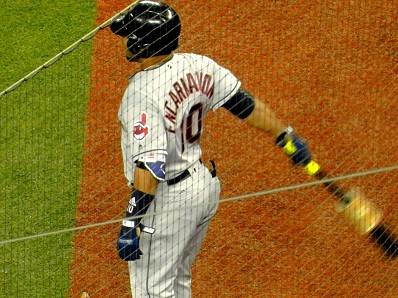 Carolina in 2006. But, that’s it. Overwhelming evidence shows that a team cannot win the Stanley Cup in the absence of a legitimate, front–line defenseman. Which the Maple Leafs lack — on the big team and amid organizational prospects. 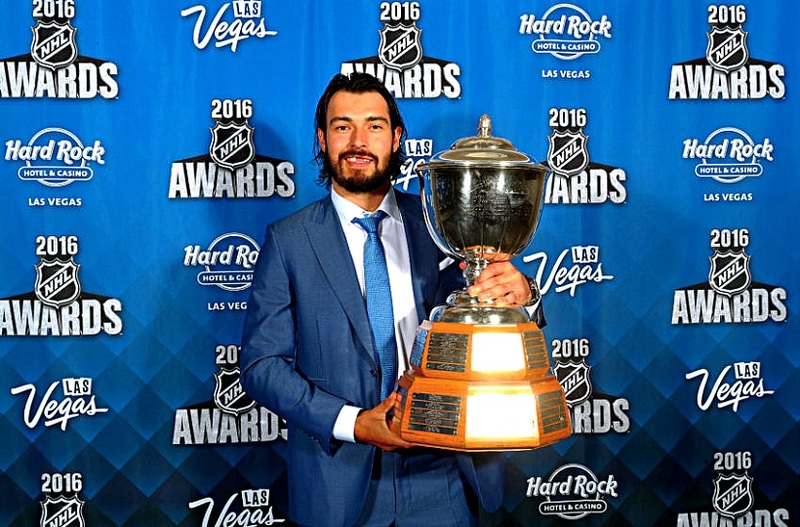 DREW DOUGHTY WON THE NORRIS TROPHY LAST SEASON AS THE NHL’s BEST DEFENSEMAN. I can tell you this, without equivocation: If Drew Doughty were somehow made available in a discussion between the Leafs and Kings, Lou Lamoriello would find a way to get it done. Virtually nothing beyond Auston Matthews would be out of bounds in the dialogue. The Leafs should be so fortunate as to go down that unlikely path. 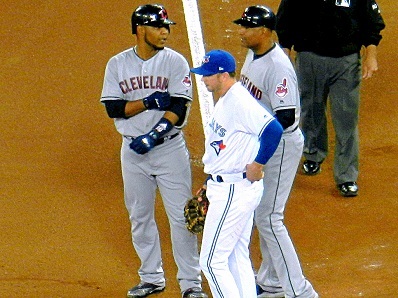 After an off–season episode that was botched by all sides, Edwin Encarnacion returned to our city on Monday needlessly in the uniform of the Cleveland Indians. 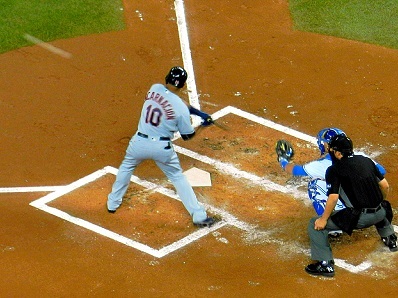 It still boggles the mind that Encarnacion and the Toronto Blue Jays were unable to find common ground on a new contract, given the player and the team were looking to re–up. As it were, double–E took his booming lumber from the shore of Lake Ontario to that of Lake Erie. Like the team he left, Edwin has been sluggish early in the 2017 Major League Baseball season, but is certain to heat up with the weather. 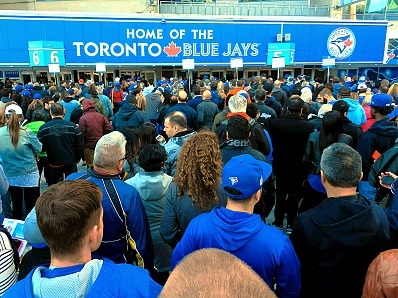 A crowd of 40,014 — roughly 8,000 shy of a sell–out — watched on Monday as Encarnacion went 2–for–3 with a walk and strikeout in the Blue Jays 4–2 victory. 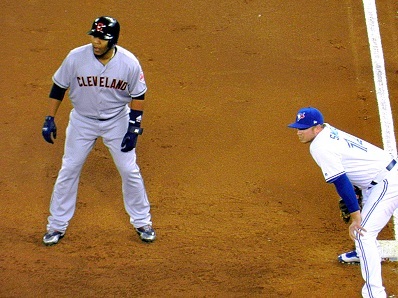 WHILE RUNNING WIND–SPRINTS PRIOR TO THE BALL GAME, ENCARNACION (RIGHT) WAS GREETED IN CENTER–FIELD BY FORMER SLUGGING MATE JOSE BAUTISTA OF THE BLUE JAYS. 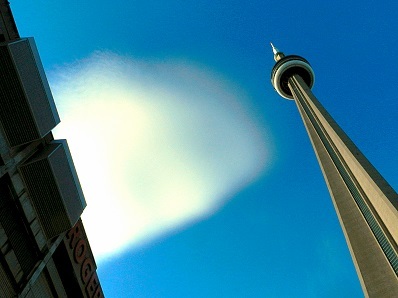 A LONE, WISPY CLOUD HOVERED OVER ROGERS CENTRE AND THE C.N. TOWER AS FANS ENDURED THE UBIQUITOUS SECURITY LINE–UPS OUTSIDE GATES 5 AND 6. 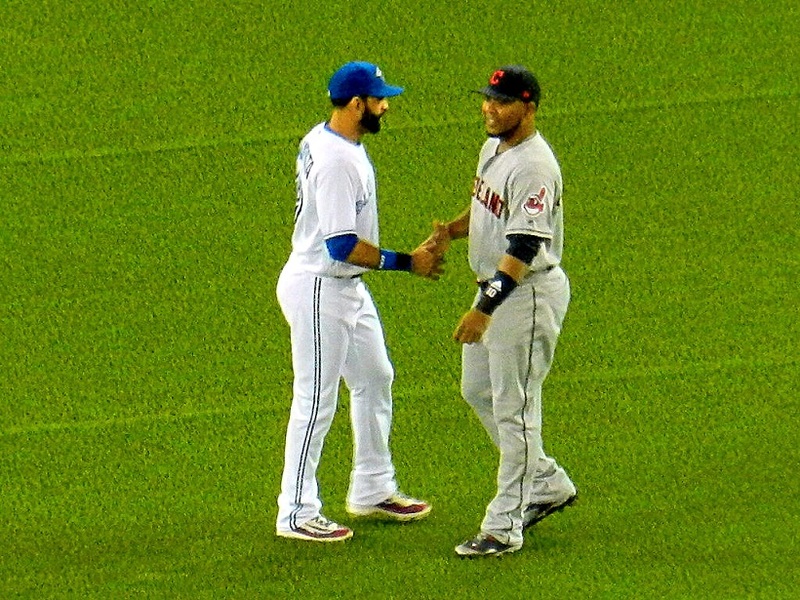 EDWIN CHECKED HIS “BELONGINGS” WHILE BAUTISTA SHOOK HANDS WITH ABRAHAM ALMONTE. 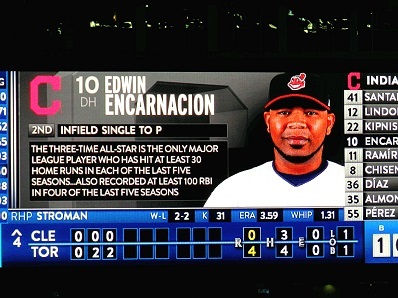 ENCARNACION BEGAN THE CLEVELAND SECOND WITH AN INFIELD SINGLE THAT DEFLECTED OFF BLUE JAYS STARTER MARCUS STROMAN. 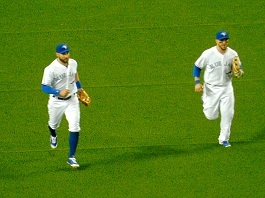 HE THEN TOOK A LEAD BESIDE EX–TEAMMATE JUSTIN SMOAK. WIDE–ANGLE VIEW FROM SEC. 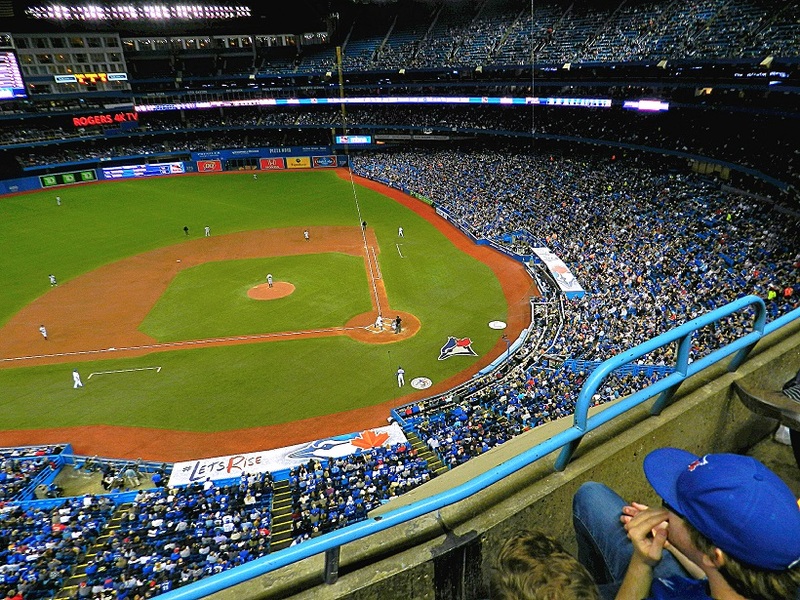 527, ROW 2 OF THE UPPER–DECK. 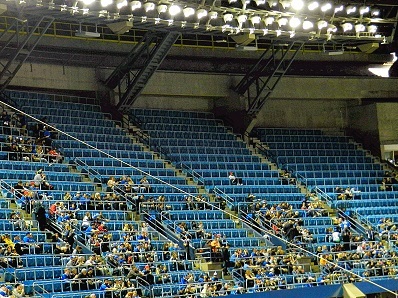 THE 100 AND 200 LEVELS OF ROGERS CENTRE WERE FILLED TO CAPACITY, THOUGH THERE WERE LARGE BLOCKS OF EMPTY SEATS IN THE FIFTH LEVEL, DOWN THE LINES. A YOUNG, CREATIVE FAN SITTING IN FRONT OF ME FLASHED HIS ARTWORK. 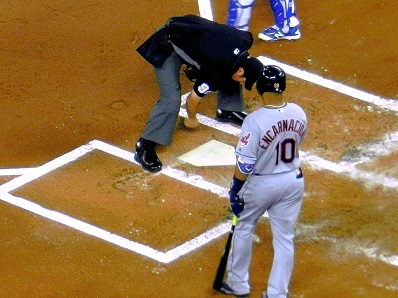 ENCARNACION SINGLED AGAIN IN THE FOURTH INNING AND WAS ERASED ON A DOUBLE–PLAY. 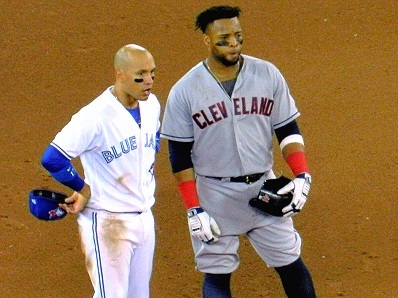 BLUE JAYS CENTER–FIELDER KEVIN PILLAR ADDED TO HIS HIGHLIGHT–REEL OF BRILLIANT CATCHES WITH AN ALL–OUT DIVE TOWARD THE FENCE IN THE SIXTH THAT ROBBED JOSE RAMIREZ OF EXTRA BASES AND SAVED TORONTO A PAIR OF RUNS. 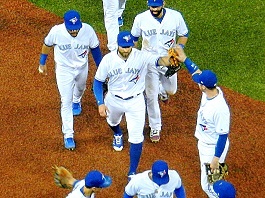 PILLAR WAS CONGRATULATED NEAR THE WARNING TRACK BY LEFT–FIELDER STEVE PEARCE AND THEN MET BY TEAMMATES NEAR THE DUGOUT. 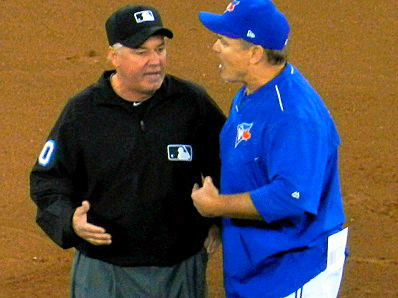 JOHN GIBBONS MADE A PITCHING CHANGE IN THE EIGHTH WHILE RYAN GOINS OF THE BLUE JAYS CHATTED WITH CARLOS SANTANA OF CLEVELAND, WHO HAD DOUBLED OFF RELIEVER DANNY BARNES. 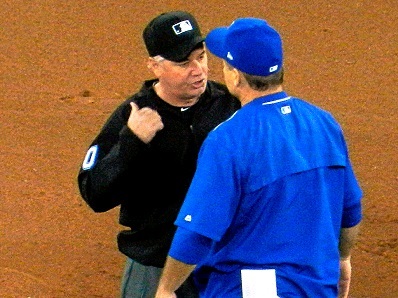 AFTER AN INTERFERENCE RULING AGAINST 2B DEVON TRAVIS OF THE BLUE JAYS, GIBBONS ARGUED AND WAS EJECTED FROM THE GAME BY SECOND–BASE UMPIRE VIC CARAPAZZA. 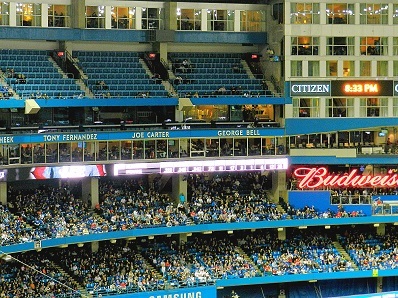 THE ROGERS CENTRE AND C.N. 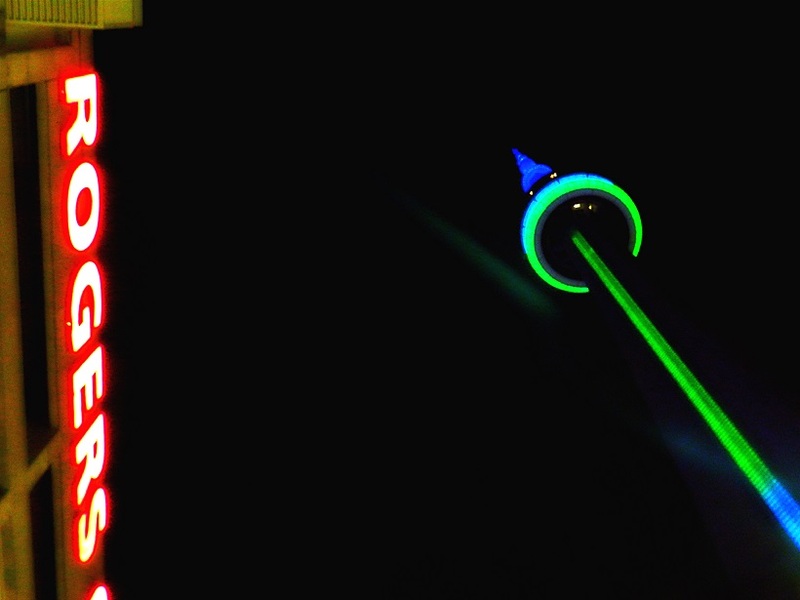 TOWER, BOTH ILLUMINATED AFTER THE GAME. I still don’t “understand” the urgency of a “number one defenceman.” Caps had a good defence and even added Shatner and the Pens without Letang still beat them because of strong offence and a hot goalie. Matthews, Marner and Nylander are the Pens Crosby, Malkin and Kessel. If the Leafs rookies can add 30 goals next year they would match the Pens output this year and the Leafs defence only allowed 10 more goals. One more solid d-man and Lou and the Leaf brass are overseas right now searching so the Leafs matching the Pens next year is certainly not out of the question. With nine rookies all improving and players like Kapenen and Dermott coming soon anything is possible but trading an elite winger for what could be only two years of Doughty is still a big gamble which means the Leafs would be totally changing the direction from rebuilding a team that can be a serious contender to going for it now and to hell with the future.